Founded in 1975, FACOMIA is France’s oldest abattoir machinery manufacturer. For more than 40 years, FACOMIA has been designing technical machines aimed at improving animal well-being, safety and performance. Wishing to cover all bases, the company includes a design office, administrative department, sheet metal production workshop, hydraulics, pneumatics and electrical engineers, fitters and an After-Sales Service. FACOMIA fully or partially equips more than 65% of French abattoirs and is expanding abroad with 50% of its turnover generated overseas in 2015. First sheep-goat hide puller with automatic release, similar to the previous one, adapted to small animals (type GMV 2) (Remuzat, SVA Vitrι, etc.). First French hydraulic roller (top-to-bottom) hide puller for cattle (type GBE) (Grenoble, Macon, La Chataigneraie, etc.). 1976 – First adaptation of a hydraulically closing front leg holding bar onto the GMV 1, with dual setting for calves. This machine became the GMV 3. Side spreader for existing network, pneumatic or hydraulic “ratchet bar” conveyor. 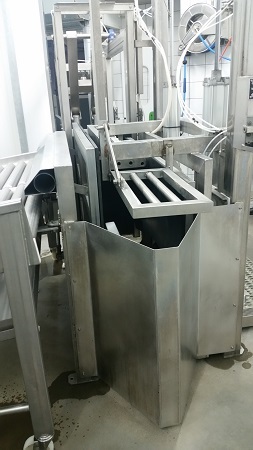 Pig brushing machine with special rollers and rubber straps (Macon, etc.). First adaptation of a French “ball” blade saw for cow or calf sternum slot. Manufacture and adaptation of expeller presses for faecal matter expulsion. 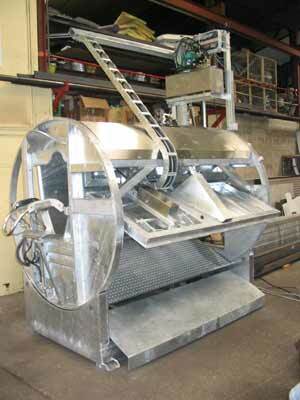 First adaptation of a more efficient and smoother variable speed drive on the cattle roller hide puller (type GBES). First marketing and adaptation of the W900Z blunting knife. 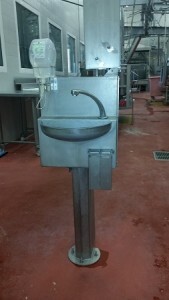 First pig bleeding assembly with “separator” type beater-defibrinator with four or more tanks, for sanitary individualisation, with pump and tank (Albi, Josselin, etc. ). 1979 – First mixed traditional/ritual cattle box with hydraulically adjustable side exit and rotation, type F (Chateauroux, Tours, etc. ). 1981 – First horizontal sheep preparation conveyor with automatic distribution (Sainte-Geneviθve, SVA Vitrι, etc.). 1982 – First head restraint on cattle rotary box, with improved automatic ejection, hydraulic cylinder-driven orientation. 1983 – First mixed ritual/traditional calf rotary box (Chambery, Cany Barville, etc.). 1984 – New improvement of the cattle box with hydraulic cylinder-driven top and bottom side adjustment and particularly efficient head restraint. It was called the F4. 1984 – Live animal loading bay with hydraulically driven height-adjustable ramp. 1985 – The mixed ritual/traditional killing box also becomes mixed calf-cow. 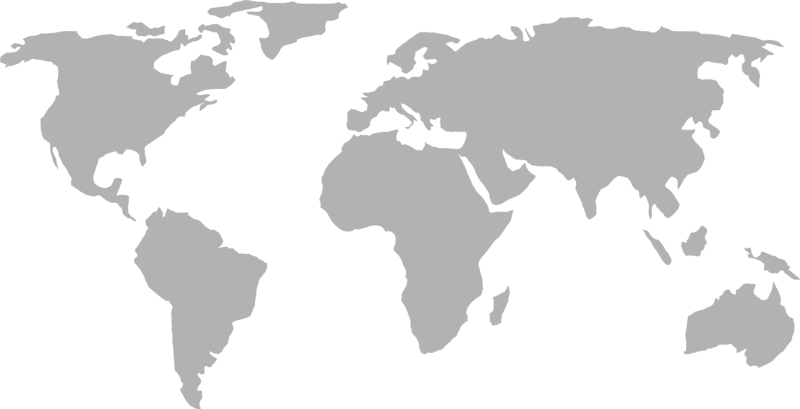 1987 – Facomia obtains good box export figures to Germany, China, Poland, etc. 1988 – Facomia crosses the Atlantic and fits an F4 mixed ritual killing box in the United States. 1989 – First roller trolley with four offset rollers, compatible with all dual-rail networks (lightweight, heavy-duty, stef). 1989 – First sheep hide puller export to Australia and the Emirates. 1989 – First GMV 2-derived height-adjustable sheep hide puller. It is currently made entirely from stainless steel and has been named the GMV 2000. 1990 – Facomia designs and proposes a new sheep processing concept. First adaptation onto F4 box of a hydraulic cylinder-driven tilting floor rendering ejection unavoidable (60 cows/h). Creation of an all closed stainless steel lightweight dual-rail network for a “Clean plant”. New generation ritual/traditional rotary calf box (Bourg-en-Bresse, etc.). id4290129 1991 – Europe’s first top-to-bottom cattle hide puller with horizontally adjustable roller for carcass approach control (St-Just-Malmont, etc.). 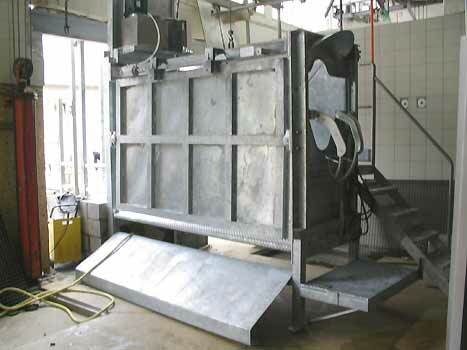 1993 – Mixed Gilt / Heavy pig trap, bleeding conveyor (Neussargue, etc.). 1998 – Complete ritual killing system for Casablanca (five cattle rotary boxes, two sheep barrel boxes, one goat single cell, etc.). 1998 – Laboratory equipment (Amiens, Tour, Angers, etc.). 1998 – Complete private abattoir (Caussade). 2006 – Increased exports to Eastern European and the Maghreb countries, particularly for the aluminium dual-rail network.